p4search is an small and powerful tool to search repository of perforce. It will allow you to do much complex file search against to your perforce server. What it does is indexes file content from different types of files. In this article we are going to see how to setup p4search perforce application installation and configuration guide in Linux. 0 upgraded, 3 newly installed, 0 to remove and 267 not upgraded. Need to get 36.4 kB of archives. After this operation, 209 kB of additional disk space will be used. oracle-java8-set-default is already the newest version (8u111+8u111arm-1~webupd8~0). oracle-java8-set-default set to manually installed. 0 upgraded, 0 newly installed, 0 to remove and 267 not upgraded. Along with the tomcat we have to run solr and jetty so it is required to install tomcat as we have to access p4 search from web interface. 0 upgraded, 7 newly installed, 0 to remove and 267 not upgraded. Need to get 6,128 kB of archives. After this operation, 7,391 kB of additional disk space will be used. Selecting previously unselected package libcommons-dbcp-java. Selecting previously unselected package libecj-java. Selecting previously unselected package libservlet3.0-java. Selecting previously unselected package libtomcat7-java. Selecting previously unselected package tomcat7-common. Selecting previously unselected package tomcat7. Selecting previously unselected package authbind. Not creating home directory `/usr/share/tomcat7'. Do not start tomcat7 service as we control tomcat from p4search. 3 Step: Install Jetty 8. 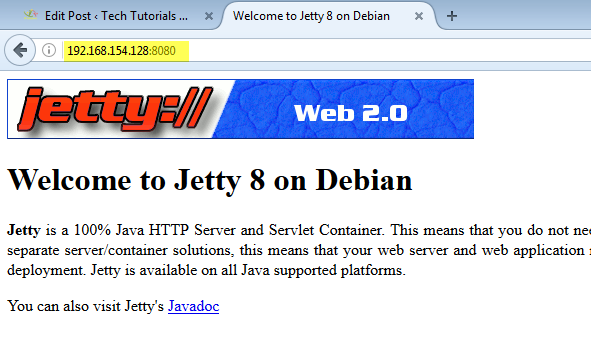 Basically jetty8 is the application we used to host our p4search web UI. 0 upgraded, 8 newly installed, 0 to remove and 267 not upgraded. Need to get 6,789 kB of archives. After this operation, 10.2 MB of additional disk space will be used. Selecting previously unselected package libjetty8-java. Selecting previously unselected package libasm4-java. Selecting previously unselected package libmail-java. Selecting previously unselected package libxalan2-java. Selecting previously unselected package libjakarta-taglibs-standard-java. Selecting previously unselected package libjstl1.1-java. Selecting previously unselected package libjetty8-extra-java. Selecting previously unselected package jetty8. Not creating home directory `/usr/share/jetty8'. Apache solr is an powerful search engine based application, which is the main base for p4search working method. Apache solr packages are not available directly on ubuntu repository we have to download manually and install. Before installing solr, as a prerequisite install python tools. Need to get 202 kB of archives. After this operation, 929 kB of additional disk space will be used. Helix p4d is required because we can’t manage it’s related things without p4 commands. 0 upgraded, 6 newly installed, 0 to remove and 267 not upgraded. Need to get 6,722 kB of archives. After this operation, 15.5 MB of additional disk space will be used. Selecting previously unselected package helix-cli-base. Selecting previously unselected package helix-cli. Selecting previously unselected package helix-p4dctl. Selecting previously unselected package helix-p4d-base-16.2. Selecting previously unselected package helix-p4d-base. Selecting previously unselected package helix-p4d. ::  The Helix Version Engine is now installed, but not yet configured. To download p4search utility use below link and copy to p4search server. Conclusion: p4search is an utility / tool to search perforce server repositories faster and more flexible way.